The Polar Station of the University of Nicolaus Copernicus (Polish: Uniwersytet Mikołaja Kopernika - UMK) is located in the western part of the Oscar II Land, in the northern part of the coastal Kaffioyra Lowland which is closed by the Forlandsundet from the west. 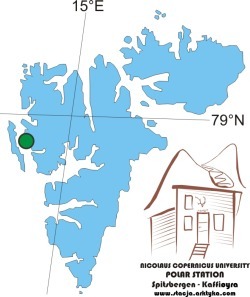 The N.Copernicus University Polar Station is situated in the area called Heggodden, about 150 metres from the seacoast and at the foot of the head moraines of the Aavatsmarkbreen. There were a few reasons for selecting the above site for the N.Copernicus University Polar Station. Predominantly, they include the following two: a large diversity of the environment of the area, and a relatively small distance form the glaciers which pose the main object of the research. Moreover, in the close vicinity the N.Copernicus University Polar Station there is a deep bay of Hornbaek. 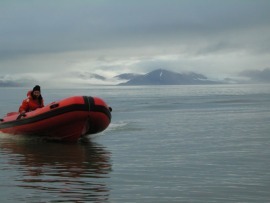 It makes a good shelter for ships and enables the expedition members to load and unload during stormy weather. Additionally, as early as mid-June the Forland Strait is free from ice. During summer season pack ice does not pose any threats to navigation. Small inter-moraine lakes provide enough drinking water during the polar summer season. Another element which upgrades the attractiveness of the location of the N.Copernicus University Polar Station is its relative closeness to Ny Alesund, a settlement which is a large international research centre. The Forland Strait is en route of small ships which run between Longyearbyen and Ny Alesund. Besides, the N.Copernicus University Polar Station is located outside national parks and reserves. As a result, moving around and carrying out research is quite easy. Scientific exploration of the Kaffioyra dates back to 1938. It was then that the first glaciological expedition to the Oscar II Land was inspired by Professor Antoni Dobrowolski, the Head of the Board of the Polar Section of the Association for Scientific Expeditions. The research area was selected by Reader Ludwik Sawicki. The studies included mainly the foreland of the Kaffioyra glaciers. For many years this area was researched by Professor Mieczysław Klimaszewski, who in 1960 published the dissertation titled "Geomorphological studies of the West Spitsbergen area between Kongsfjord and Eidembukta". The paper includes a detailed description of the forms and deposits, as well as glacial and periglacial processes of the Kaffioyra region. This was first such publication on the region. As a result, a group of geographers from the Nicolaus Copernicus University in Toruń decided to organize an expedition into the same area to conduct comparative research. In 1975 the first Toruń Polar Expedition set sail. It was conducted by Professor Jan Szupryczyński from the Geography Institute of the Polish Academy of Sciences. The expedition worked in two teams. The first one carried out the research in the southern part of the Kaffiyora Lowland, while the second one in its northern part. The northern team, headed by Professor Czesław Pietrucień, concentrated on hydrological and glaciological studies. That year, on the initiative of Professor Czesław Pietrucień, a special building was constructed by the moraines of the Aavatsmark Glacier. It was the beginning of the contemporary polar station. In 1995 a new cycle of the summer expeditions to the Polar Station began, and in 1996 a series of spring expeditions was initiated. The main aim of these expeditions has been to study winter snow accumulation on the glaciers in the Kaffioyra region, observations of winter outflow from the glaciers, geodesic work undertaken in the place inaccessible in summer, and penetration of glacier caves and tunnels. Since then, the expeditions have been headed by Marek Grześ, Ireneusz Sobota or Krzysztof R. Lankauf. As many as 300 people have taken part in the expeditions so far. These have mainly included scientists, but also climbers, speleologists and scuba-divers. Once the station has had an extension addend, it can host 10-15 people at any one time. The new section of the station is 32 sq. m downstairs and 24 sq. m upstairs. This includes a study, a workshop, a bedroom as well as two bedroom entresols. The extension is connected with the old section of the station, which includes a living room and a bedroom, but there is also a separate entrance to the new part of the station. Additionally, the station gained extra storage floor, a laboratory, a bathroom, as well as a garage to keep boats, snowmobiles and engines. All together the station now has about 100 sq. m.
The station is used 3 to 4 months annually, but it is possible to stay there for as long as a whole year. 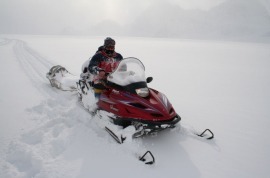 It is equipped with necessary technical facilities, motor-generators, solar panels, motorboats and snowmobiles. More important measurement equipment includes: a weather station with the basic measuring instruments (the measurements conducted since 1975); automatic weather stations (with the measurements taken at any intervals); limnigraphs and loggers installed in the selected watercourses (measurements of water levels, flow rates and the selected physicochemical features of water since 1975); a system of ablation poles installed on the glaciers; ice drills; loggers for measuring ground temperatures and ice temperatures, and others. The extension of the station will enable larger groups of scientists to work and conduct research. The fact that both the living and laboratory space has been enlarged is especially important, as the station is often visited by scientists from all over the world. As a result, the extension will make it possible to intensify current international contacts, as well as start new co-operation projects in the Kaffioyra region. Moreover, most Polish polar research in the north-west Spitsbergen is based on the N.Copernicus University Polar Station. The new investment will enable the scientists to use the station all year round. This is especially crucial in terms of the research which needs systematic measurements. As a result, the scope of the studied issues and the number of expedition members will increase. A larger numbers of analyses made directly at the measurement site will lead to the decrease of the research costs, and will make the work both easier and safer for the expedition members. In the coming years next polar expeditions of the UMK are being planned, as well as scientific conferences and fieldworks based on the N.Copernicus University Polar Station and its facilities.